Sometimes things you’ve always dreamed of happening grab you by pure chance. 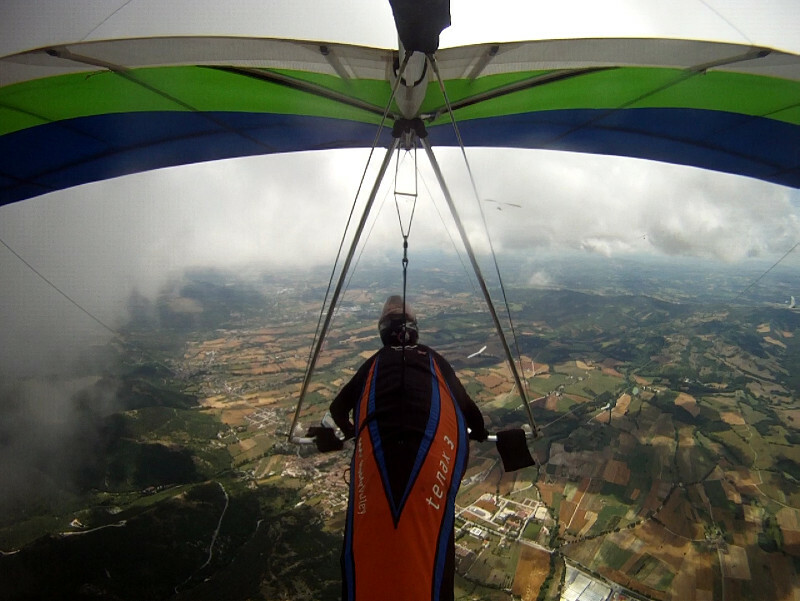 I could have organized this event at great expense in England on some boring ridge soaring ridge, but I got unlucky during a competition, and then got real lucky to do this. 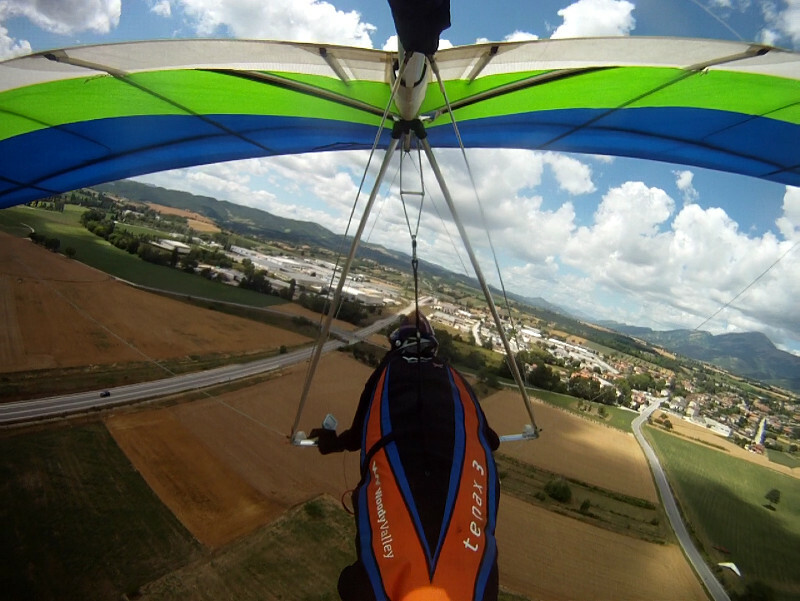 At the start of the day I was mixing it up at cloud-base with all these competition hang-gliders. And then 20 minutes later I got found out and scraped down into a wheat field 10kms to the north of take-off. Luckily one of the other competition pilots came down near me, and his retrieve driver (who, unlike my retrieve drivers isn’t more often retrieved by the pilot than the correct way round) picked us both up, and I persuaded them to take me up to the top of the hill for one last flight on Monte Cucco at the end of the holiday. And just then, Becka was about to take off on her tandem flight which we had been rescheduling day after day during the week. 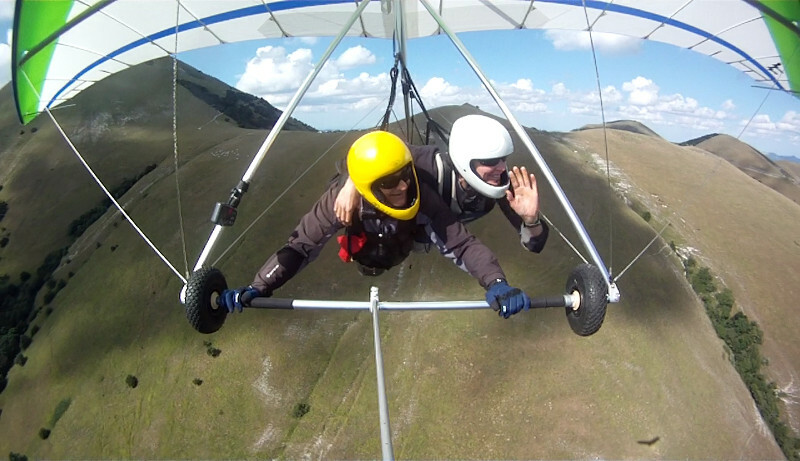 Her tandem flight lasted long enough for me to completely rig my glider, take off, and climb up to them close enough for a wave. Later, I carried on flying for too long and landed in the field while they were trying to give the prize giving. This was delayed because of me as they needed my tracklog from my crappy flight before they could officially calculate and release the figures. When I finally showed up I was invited to stand on the winners podium and be humiliated in front of everyone while the contest scorer squirted a water pistol at me. Becka does not have a photo.